Super Sonico: Acrylic Key Holder - 10th Anniversary Ver. An acrylic key holder with original illustration by minoa! 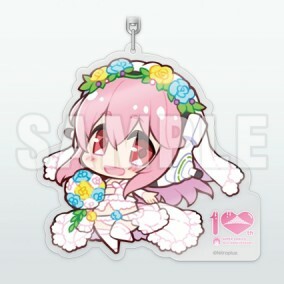 An acrylic key holder featuring an original SD illustration of Sonico in her wedding dress by minoa, commemorating the 10 years since Super Sonico's debut! A super tiny, super cute Sonico for you to worship and adore. First available at Wonder Festival Winter 2017.